To control product quality, you have to control the process. The best way to control the process is by monitoring real-time process data. DataTrace® MPRF Temperature data loggers deliver the data from chilling, freezing and room temperature to pasteurization, EO sterilization and depyrogenation. MPRF Temperature data loggers provide accurate data over a wide range with remarkable ease; from as low as -80ºC to +400ºC. This makes it easy to monitor processes across a wide spectrum of temperatures in a variety of different industries and products. 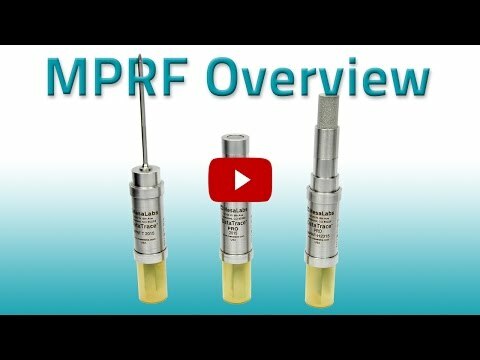 The MPRF Temperature data logger provides accurate data to help you optimize food, pharmaceutical and other manufacturing processes. The closer the sensor is to the product, the more valuable the collected data; if this data is displayed in real-time, control and quality benefit dramatically. Mesa’s DataTrace®wireless data loggers easily fit inside or externally in a variety of packages, like an ethylene oxide ER pack during sterilization, to maximize accuracy and process validation. And since it is wireless and operates at low voltage, it is intrinsically safe for hazardous environments.